Science at Work explores scientific activity and inquiry across Indiana University, including not only new breakthroughs but also the dedicated people, smaller achievements and incremental progress without which the big discoveries could not happen. If houseplants, like houseguests, start to stink after three days, then an extremely rare plant that hasn’t bloomed in nine years at IU’s Jordan Hall Greenhouse is due to create a stench for the ages. One of the world’s largest species of flower, the Amorphophallus titanum or titan arum, is expected to put forth its first bloom any day now. Known as the “corpse flower” for its overpoweringly foul odor, the bloom of this plant is an extremely rare sight. The corpse plant at IU’s Jordan Greenhouse on July 14. Adam Fudickar, a postdoctoral researcher in the Department of Biology, gives a sense of scale. Photo by Terri Greene, Indiana University. As of July 19, the plant’s stem had reached a height of 3 feet, with several more feet expected. Interested individuals can follow the flower’s progress in real time via a live webstream, or visit the IU Bloomington Department of Biology’s Facebook page and a special Web page for updates on the expected bloom date. A native to western Sumatra, the corpse flower takes eight to 20 years to bloom for the first time. After that, the flower appears every three years, and each bloom lasts only 24 to 36 hours. This is the first bloom of IU’s flower, and only five corpse flower blooms have been publicly recorded worldwide in the past year. The flower will be open for public viewing from 7:30 a.m. to 3:45 p.m. Monday to Friday and 9 a.m. to 3 p.m. Saturday and Sunday at IU’s Jordan Hall Greenhouse, at the corner of Third Street and South Hawthorne Drive in Bloomington, Ind. Parking is available at the Atwater Garage on Faculty Drive, between Third Street and Atwater Avenue. The powerful scent of the corpse flower is designed to attract pollinators, such as sweat bees, beetles and carrion flies, which normally feed on dead animals. Because the flower blooms so rarely and lasts for so few hours, it requires an extremely strong odor to attract these insects quickly over a large area. The corpse flower had reached a height of 3 feet by July 19. Photo by Eric Rudd, Indiana University. The corpse flower itself is technically made up of a cluster of small flowers arranged at the base of the stem, a structure known as an “unbranched inflorescence.” Normally the stems, which can weigh 110 pounds, grow about 3 to 5 feet tall, after which a taller leaf replaces the bloom. Some plants grow much larger, however, with flowers of 10 feet tall recorded and leaves that span 20 feet tall and 16 feet wide. The heaviest stem ever recorded – 258 pounds – was documented at the Botanical Garden of Bonn, Germany, in 2006. 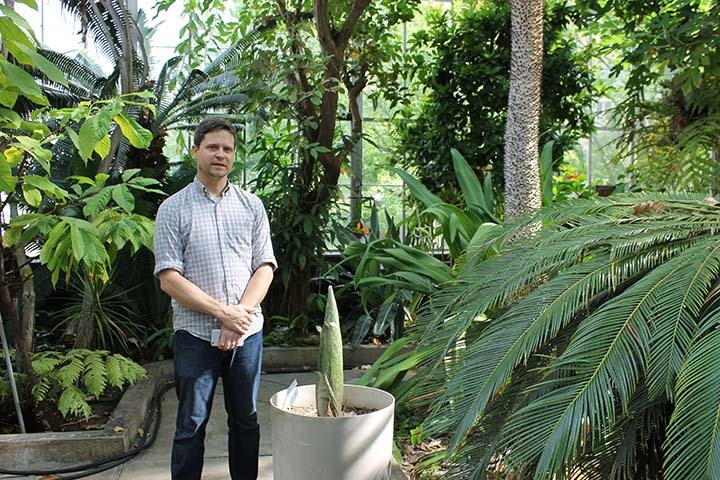 Despite its size, the titan arum doesn’t possess the largest unbranched inflorescence in the world – that title goes to the Lobelia rhynchopetalum, or giant lobelia, which only blooms every 50 years, according to Eric Knox, director of the IU Herbarium. But the titan arum is unquestionably the largest species cultivated in a greenhouse environment. 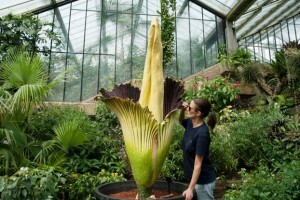 And while IU’s greenhouse staff cannot predict the final size of this particular bloom, IU gardener John Leichter said the plant is once again “about to outgrow its pants,” having been repotted every other year for the past nine years because of its rapidly increasing size. 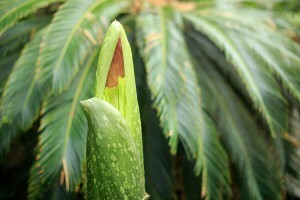 The titan arum also requires specialized care, Leichter added, including the right temperature, humidity and watering. Too much water, for example, rots the plant’s bulb; too little and it will never bloom. A corpse plant in bloom. Photo by Kew Royal Botanical Gardens. Creating a new plant from a single flower is a challenge since the male and female parts of the plant mature at different rates. After the plant blooms, department gardeners hope to save the pollen until the next flower’s appearance in three years to create a second plant through self-fertilization. 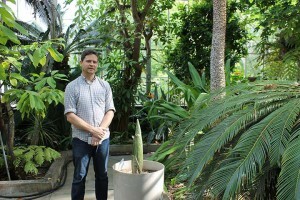 In addition, the Jordan Hall Greenhouse hosts two smaller plant species whose flowers also produce an extremely pungent smell: a voodoo lily, which smells like horse manure, and a “devil’s tongue,” which smells “like three-day-old roadkill,” according to Leichter. The late Greg Speichert, former director of the Hilltop Garden and Nature Center at IU, donated the titan arum to IU in December 2007. Members of the public and the media are welcome to view the flower. For more information, contact Terri Greene at 812-856-1476 or tgreene@indiana.edu or the Jordan Hall Greenhouse at 812-855-7717 or biogreen@iu.edu.